Want to promote an event or a new sales promotion? Talk with us about developing your next email blast. 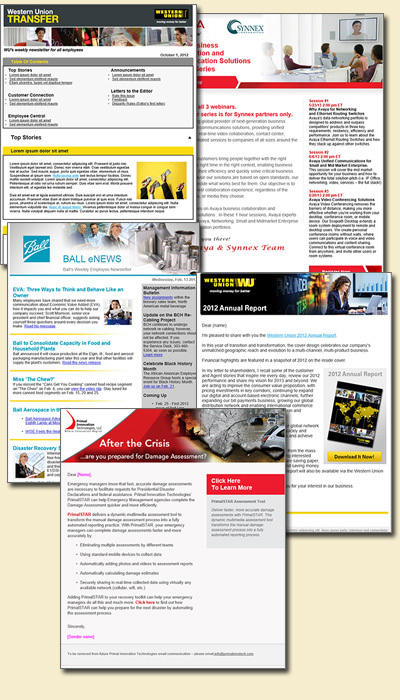 We can create HTML and text based newsletters/invites to be emailed to your client lists. We also can provide statistics about what areas your customers are looking at. This is a very powerful tool. Other options include building a website for letting your customer manage what information they would like to receive and an area to subscribe for future communications. Perhaps your needs are on a smaller scale, we can assist there also. In the past we have been provided a list of email addresses and handled the administration of sending the blasts. We can even make it look like it came from your organization. Talk to us to customize a solution to fit your needs. Here are some past examples of creative communications we have developed.